Today was Day #4 of Chocolate and Rocky Road Theme Week. Before there was Rocky Road ice cream -- aptly named after the Stock Market crash and Great Depression of 1929 -- there was Rocky Road-like desserts. 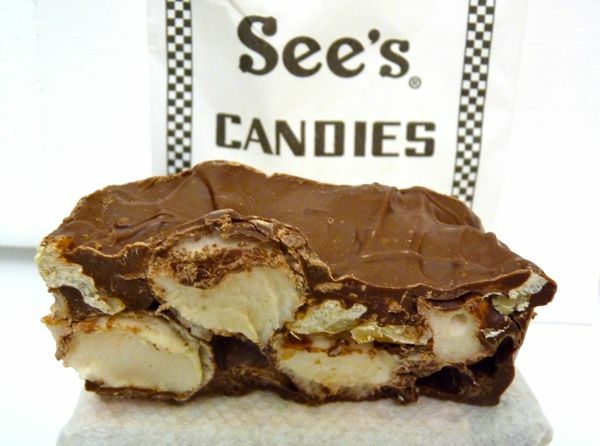 See's Candies (based in South San Francisco, CA) sells hearty slices of Rocky Road candy, loaded with large marshmallows, walnuts, and milk chocolate of course. While still quite sweet, it was a bit fresher and lighter tasting than fudge.